Antonio Ledezma says Venezuela "doesn't tolerate authoritarian governments"
(CNN) -- In his first public appearance since staging a hunger strike to protest the political tactics of Venezuelan President Hugo Chavez, Caracas Mayor Antonio Ledezma called on the Organization of American States to investigate the Venezuelan opposition's claims. 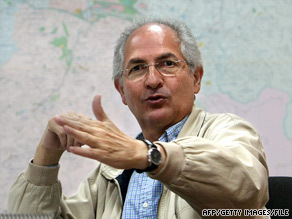 Caracas Mayor Antonio Ledezma staged a six-day hunger strike. Chavez's strong-arm tactics violate the Inter-American Democratic Charter, Ledezma said at a news conference Monday. "This country doesn't tolerate authoritarian governments," Ledezma told reporters. "That's why we declare ourselves slaves, but of our national constitution, because we will never be slaves of the whims of a political or military leader." It was Ledezma's first public appearance since abandoning a six-day hunger strike last Wednesday. Ledezma will meet with opposition governors this week to set an agenda for an expected meeting with the OAS, a spokesman for the mayor told the Noticias24 news Web site. The hunger strike was to protest what the opposition alleges are illegal power-grabbing moves by Chavez's government. Chief among Ledezma's complaints was the creation in April of a "head of government" appointed by Chavez who took over many of the mayor's duties in addition to offices and budget. Ledezma lost his management authority over schools, hospitals, police and fire departments. CNN's Ariana Figuera-Bercebal contributed to this report.